Drought indices based on precipitation are commonly used to identify and characterize droughts. Due to the general complexity of droughts, the comparison of index-identified events with droughts at different levels of the complete system, including soil humidity or river discharges, relies typically on model simulations of the latter, entailing potentially significant uncertainties. The present study explores the potential of using precipitation-based indices to reproduce observed droughts in the lower part of the Jinsha River basin (JRB), proposing an innovative approach for a catchment-wide drought detection and characterization. Two indicators, namely the Overall Drought Extension (ODE) and the Overall Drought Indicator (ODI), have been defined. These indicators aim at identifying and characterizing drought events on the basin scale, using results from four meteorological drought indices (standardized precipitation index, SPI; rainfall anomaly index, RAI; percent of normal precipitation, PN; deciles, DEC) calculated at different locations of the basin and for different timescales. Collected historical information on drought events is used to contrast results obtained with the indicators. This method has been successfully applied to the lower Jinsha River basin in China, a region prone to frequent and severe droughts. Historical drought events that occurred from 1960 to 2014 have been compiled and cataloged from different sources, in a challenging process. The analysis of the indicators shows a good agreement with the recorded historical drought events on the basin scale. It has been found that the timescale that best reproduces observed events across all the indices is the 6-month timescale. This paper was published in February 2018 in the Hydrology and Earth System Sciences journal. Drought is a natural phenomenon that results from persistent deficiency of precipitations over an extended period of time compared with some long-term average condition (e.g., precipitation), resulting in a water shortage for some activity, group, or environmental sector (Landsberg, 1982). It generally affects larger areas than other hazards and more people than any other natural catastrophe (Keyantash and Dracup, 2002; Wilhite, 2000). In China, droughts represent the most severe natural threat for socioeconomic development and ecosystems (Mei and Yang, 2014). Drought events occur in the Jinsha River basin (JRB) and surrounding regions with high frequency. They affect a wide range of areas and cause huge losses to the agriculture sector (He et al., 2013). To reduce and anticipate such drought impacts, a comprehensive characterization of the phenomenon is essential. Effective and accurate analysis of hydrometeorological data is a key input. Drought indices are useful for tracking droughts and providing a quantitative assessment of the severity, location, timing and duration of such events (World Meteorological Organization and Global Water Partnership, 2016), but also for real-time monitoring (Niemeyer, 2008), risk analysis (Hayes et al., 2004) and drought early warning (Kogan, 2000). Some organizations and agencies already rely on the use of indices in their decision-making processes, thus enhancing proactive drought management policies (Wilhite, 2000). The choice of index should be based on the type of drought (meteorological, agricultural, hydrological or socioeconomical), the climate regime and the regions affected, as well as the available data. It was found that measured meteorological data were limited in the study region and that precipitation was the single most reliable type of exploitable information. The present study thus focuses on the use of meteorological indices based only on precipitation data. The main advantages are their ease of use, the limited data requirements and the capacity for early detection of drought events, while extensive literature and calculation tools are widely accessible (World Meteorological Organization and Global Water Partnership, 2016). It has been decided to base this study on the standardized precipitation index (SPI, McKee et al., 1993, 1995), the rainfall anomaly index (RAI, Van Rooy, 1965), the percent of normal precipitation (PN, Barua et al., 2011) and the deciles index (DEC, Gibbs and Maher, 1967). To fill the lack of specific drought-related information, most studies assess the performance of drought indices against results from hydrological soil water models (Halwatura et al., 2016; Hao and AghaKouchak, 2013; Trambauer et al., 2014; Vasiliades et al., 2011; Wanders et al., 2010). However, the performance of these types of studies depends on the accuracy of the models. Their limitations and uncertainties represent an important drawback and should be addressed (Mishra and Singh, 2011). An alternative that often requires more time-consuming work is the compilation of historical records of drought events from different sources. Consequently, their duration, the water scarcity levels, and the drought impacts on population and agriculture can be estimated and then integrated into the analysis. This enables one to identify other types of droughts such as socioeconomical droughts that are hard to assess with hydrological models. Regarding their spatial resolution, the available drought indices may be based on local measurements (Zhou et al., 2012) and index calculations are usually applied to stations or cells of gridded precipitation datasets; overall spatial patterns on catchment or sub-catchment scales are thus hardly captured. As stated above, droughts affect large areas whose limits are often vaguely demarcated. In addition, water resources are part of a more complex interrelated network which links the source to the point of consumption, where isolated rainfall deficiencies do not necessarily imply a shortage of water availability or even a drought event. Some work (Bhalme and Mooley, 1980; Fleig et al., 2011; Mitchell et al., 1979) suggests the use of drought area indices for the study of droughts that considers areal coverage. The use of overall indicators capable of capturing in a single value the effect of the rainfall deficiency at a regional level is thus convenient and will be applied in this study based on the abovementioned work. The objective of this study is to capitalize on the collection of drought events that the authors have registered in the lower part of the JRB since 1960 to evaluate and calibrate two indicators capable of identifying drought occurrence and characterizing their intensity on the catchment scale. These indicators are based on commonly used meteorological drought indices for particular timescales. The JRB is a sensitive zone in terms of water resources, food security, ecosystem management and human well-being where glacier and climatic variability greatly influence the water regimes and availability. The JRB constitutes the upper part of the Yangtze River Basin and is located between 24°28′N–35°46′N longitude and 90°23′E–104°37′E latitude in southwestern China, with a catchment area of 473'200 km2 (Fig. 1). The lower part of JRB is a hot-dry valley region characterized by a southwest monsoon climate. The hydrologic regime is characterized by a pronounced seasonal cycle with an annual average precipitation of 600–800 mm/year. Dry season (November to April) precipitation accounts for 10% to 22% of the annual precipitation. Figure 1 shows the division of the JRB in three parts (Upper, Middle and Lower), and the locations of the meteorological stations used. This study focuses on the analysis of drought events in the lower JRB. The precipitation data needed in this study have been obtained from the China Meteorological Data Service Center (CMA), and downloaded from its data sharing service system (CMDC, 2017). A preliminary quality check and correction of datasets (including data gap-filling) is performed by CMA before uploading them to the system. The monthly precipitation data of 29 meteorological stations within or around JRB, recorded from 1960 to 2014, have been collected and processed. More than 50 years of continuous data are thus available. The spatial distribution of the stations is supposed adequate for the purposes of the study: the stations are distributed relatively evenly both in the zonal and meridional directions, with no zones having a significantly denser presence of stations that could overestimate their importance. Figure 1. a) Location of the JRB in China; b) subdivision of the JRB for this study; c) overview of the lower JRB with the location of the 29 meteorological stations. In order to obtain a good basis for the evaluation of drought indices performance, historical drought events have been collected since 1960. The information required for the identification and characterization of major droughts in the lower JRB has been compiled from different sources, including scientific literature, inventories (e.g., international disaster database, Chinese inventories), governmental reports and yearbooks, newspaper and internet articles. Detailed information is available for the major drought events over the past 20 years. Before 1980, much less information about droughts in the lower JRB is available. Moreover, detailed information prior to 1960 could not be found. Compiling and harmonizing the information from these different data sources was a challenge. The drought event descriptions in the scientific literature often give an overview about the entire event in a descriptive way without detailed information about the affected area and damage. They often provide information about the meteorological conditions and the duration of the event. Available information from government reports and databases, in contrast, generally contain information in high detail for a specific county (e.g., affected areas in km2), but neither give information about the entire affected area if the event affected several counties, nor about prevailing meteorological conditions. Information at very different levels of detail and various contents were collected. As a first step, all available information was registered in a database. Particularly, drought events since 2000 are all mentioned in a different source, what significantly enhances the reliability of their existence and related information. Most of the drought events before 2000 are documented in detail in He (2010), and some of these major dry periods are also mentioned in scientific literature such as He et al. (2016) and Wang et al. (2015). Even if the amount of data and level of detail is lower for these older events, their occurrence and temporal positioning can be assumed as reliable. In a second step, the level of detail was harmonized for the most relevant information and summarized in Table 1. This catalogue of the most relevant drought characteristics focuses on the affected area, the start date of the drought events, their duration, their spatial and temporal distribution, their severity and the impacts on the population and agriculture, including damage and financial losses. The time of occurrence and duration is given in seasonal units, the affected area is described on a county scale and the indicators and impacts are summarized in a descriptive way, as better accuracy was not feasible for all events. In total, 13 major drought episodes have been registered from 1960 until 2014. However, this data set is probably not complete, as non-documented events likely have occurred. A clustering of severe and sustained droughts in the JRB has been observed from 2009 to 2014. Another period with high drought activity and severity can be detected between 1980 and 1990. Table 1. Catalogue of historical drought collected for the lower JRB (DJF=December-January-February, MAM=March-April-May, JJA=June-July-August, SON=September-October-November). Precipitation deficit of 50% from November 62 to April 63. Drinking water shortage for 900'000 people. Impacts on 3'700 km2 agricultural land. Impacts on 7'000 km2 agricultural land, poor harvest/crop loss. Drinking water shortage for 2 million people or 3 million people and 2 million livestock. Impacts on 6'000 km2 agricultural land, poor harvest/crop loss. Maximum in precipitation deficit: 50–80%. Drinking water shortage for 2 million people and 1 million livestock. Impacts on 9'300 km2 agricultural land. Temperatures in Yunnan province 2–3°C higher than long-term average. Dayao County: 150 days without rain. 8'000 km2 damaged agricultural area. Temperatures in Yunnan province 2–3°C higher than long-term average. The cities of Dali, Baoshan, Dehong, Chuxiong, Lincang have almost no rainfall during the whole winter. Drinking water shortage for 3 million people and 2 million livestock. Impacts on 5'800 km2 agricultural land. High temperatures; in April to early June, the temperature is 1°C above the same period of history in most parts of Yunnan province. Precipitation deficit of 20–80% in May-June November. 56 days without precipitation. Drinking water shortage for 6 million people and 4 million livestock. Impacts on 15'200 km2 agricultural land, poor harvest. Average temperature anomaly of plus 1°C. Drinking water shortage for 21 million people and 11 million livestock. Impacts on 43'500 km2 agricultural land, poor harvest. Temperatures 0.4–1.1°C higher than normal. From June to September 2011, persistent high temperature weather conditions. Precipitation deficit of 20–60%. Drinking water shortage for 12 million people and 9 million livestock. Impacts on 19'000 km2 agricultural land. Cargo shipping has been suspended. Drinking water shortage for 2.4 million people and 1.6 million livestock. Impacts on 6'500 km2 agricultural land. From October to April 0.5°C higher temperatures than normal, in February 2.5°C higher than long-term average. Jan-Feb: precipitation deficit of 45–55%. More than 3 million people and about 2 million large livestock had drinking water shortage with varying degrees. 323 small rivers and 331 small reservoirs dried up. 23'300 km2agricultural area affected (whereof 15'500 km2 forest). Spring temperatures 2–4°C higher than historic values in SW China. Spring precipitation in central Yunnan and south Sichuan province was 50–90% less than average of the same period. Drinking water shortage for 1.6 million people in Yunnan province. 106 rivers and 76 reservoirs dried up. Affected area: 6'080 km2. The beginning and the end of the event, which defines its duration. The drought intensity, derived from the index value. The geographical area affected by the drought. The following guidelines specify the approach proposed in this study to characterize drought events at basin scale based on precipitation data available at each station and how to contrast these results with the catalogued historical events. First, precipitation data are used to calculate different meteorological drought indices for each station and for different time scales (1-, 3-, 6-, 12-, 24- and 48-month) using the 1951-2000 reference period. In this study, four commonly used meteorological drought indices have been applied: the standardized precipitation index (SPI), the rainfall anomaly index (RAI), the percent of normal precipitation (PN) and the deciles index (DEC). Their definition basically rests upon the comparison of precipitation values with the normal value, resulting in a single number. A detailed description of these indices and the criteria for the classification of droughts according to their values can be found in the technical literature (McKee et al., 1993, 1995; Van Rooy, 1965; Barua et al., 2011; Gibbs and Maher, 1967) and in this article. Then, according to the mentionned criteria, these values are used to detect potential drought events at a given station and at a given time. In order to aggregate results from all stations of the basin, two indicators are proposed in this study: the Overall Drought Extension (ODE) and Overall Drought Indicator (ODI). The results of these indicators will then be contrasted with historical recorded events to define the best combination of index and time scale used for the definition of the ODE and ODI indicators. According to McKee et al. (1993), a drought event occurs at the station level any time the SPI is continuously negative and the SPI reaches a value of –1.0 or less, which corresponds to moderately dry condition or drier. The drought begins when the SPI first falls below zero (mean of the normalized precipitation) and ends with the positive value of SPI following a value of –1.0 or less. The drought magnitude is the positive sum of the SPI for each month during the drought event. The intensity of a drought is defined as the magnitude of this event divided by its duration. Figure 2 shows an example of the SPI-6, SPI-12 and SPI-24 series calculated at the Chuxiong station. Drought periods are colored in orange and the lower threshold that defines their occurrence in red. The influence of the time scale on the number and duration of detected droughts is clearly apparent. It is worth noting that there are periods in Figure 2 that identify very short droughts (one or two months long), which is due to the identification criteria based on the index values. Figure 2. Example of the SPI-6, SPI-12 and SPI-24 series at the Chuxiong station, indicating drought periods in orange (lower threshold in red). A drought event occurs any time the index is continuously below its normal value and reaches the moderately dry condition class. The drought is considered to begin when the index first falls below its normal value. The drought ends when the index exceeds its normal value. Table 2 summarizes the thresholds for each index that specify the drought event’s start and end criteria, which correspond respectively to the limit of the moderately dry class and to the index normal value. Although the “normal value” of DEC would be 50% (which corresponds to the median of the precipitation records), in this study the drought end criterion suggested for this index is 60%, which is the limit between near and above normal conditions (Jain et al., 2015; Tsakiris et al., 2007). Table 2. Values of the thresholds defining the start and the end of the drought events, for each index. When analyzing directly these meteorological indices, the results only concern each station’s surroundings without capturing the patterns of neighboring areas. However, available historical records refer to regional droughts characterized by larger areas that cover several stations. In order to consider the basin as a whole in the definition of drought occurrence, duration and intensity, the resulting indices must be consistently extended to the entire area and then combined in overall indicators. For that purpose, a regular grid divides the lower JRB into a 400x300 cells raster (400 rows and 300 columns) adapted to the study region and the available information, which represents a resolution of 1 cell / 3.2 km2. The chosen grid resolution must be adapted to the data, the computational requirements and the performance needs of each case. After trimming off the areas sticking out of the basin boundaries, the raster possesses 44'133 cells. Index values have been calculated at each grid cell by applying the inverse distance weighting spatial interpolation from the values available at the stations. For this study, we followed the approaches taken for the definition of drought area indices (Bhalme and Mooley, 1980; Mitchell et al., 1979) and regional drought area indices (Fleig et al., 2011). It is thus considered that a basin-wide event is ongoing when a substantial part of the basin is under drought conditions. It is therefore necessary to identify the portion of the territory for which the calculated index indicates a drought. An indicator to detect drought occurrence on the basin scale has been set up based on the criteria described above to identify an event considering the index values (Fig. 2). The ODE ranges from 0% (when no drought is occurring at any point of the basin) to 100% (when the entire basin is suffering an event). It highlights the coverage of a drought, allowing a direct comparison between registered historical information and calculated results. Moreover, it helps define the temporal component of droughts as it states the beginning and the end of an event. However, it does not take into account its intensity. The ODI expresses the average severity in the drought-affected part of the basin. It gives information about the meteorological stress level of the areas being effectively affected by a drought. Moreover, this indicator may help complete the collected historical records which include little information on the magnitude of the events. Lower values of this indicator denote drier conditions. Undefined values occur when no cells are under drought conditions. Only cells under drought conditions have been considered to define this indicator. The ODI must always be used together with the ODE: whenever a drought has been detected with the ODE, its overall intensity may be assessed with the corresponding value of the ODI. In order to support the choice of an index and timescale combination for the definition of the ODE and ODI, an assessment of the quality of the forecasts performed with the different variants is recommended. The hypothesis is that detected drought events (i.e., the forecasts) correspond to the cases when the ODE value exceeds a given threshold, which indicates that a certain area is affected by an event. The temporal coincidence of these forecasts has to be then contrasted with the occurrence of recorded droughts (i.e., the observations). As stated above, Fig. 2 shows that very short index-based events risk being forecasted. In order to avoid an overestimation of droughts, an additional 3-month criterion for beginning and ending forecasted droughts was established: an event will be effectively detected when the ODE value exceeds the threshold for at least 3 consecutive months. correct rejection: when, during a month where no drought has been observed, no drought is detected. Table 3. Contingency table of the comparison between forecasts and observations. The PSS ranges from -1 to +1: perfect forecasts receive a score of one, random forecasts receive a score of zero and negative values indicate less skill than a random prediction. A suitable combination of the index and timescale will then lead to higher PSS values. where the standard errors in miss (SEM) or false alarm (SEF) rates can be estimated by interpolating the values of the score confidence interval discussed in Agresti and Coull (1998), as suggested by Thornes and Stephenson (2001). If the PSS±1.96*SEPSS interval does not include zero, then the null of a random forecast can be rejected at a 95%confidence level. Following the previous approach, the series of the SPI, PN, RAI and DEC indices were calculated for different timescales (1-, 3-, 6-, 12-, 24- and 48-month timescales) within the period of 1960–2014. First computed at the 29 stations, these indices were then extrapolated to the rest of the lower JRB. 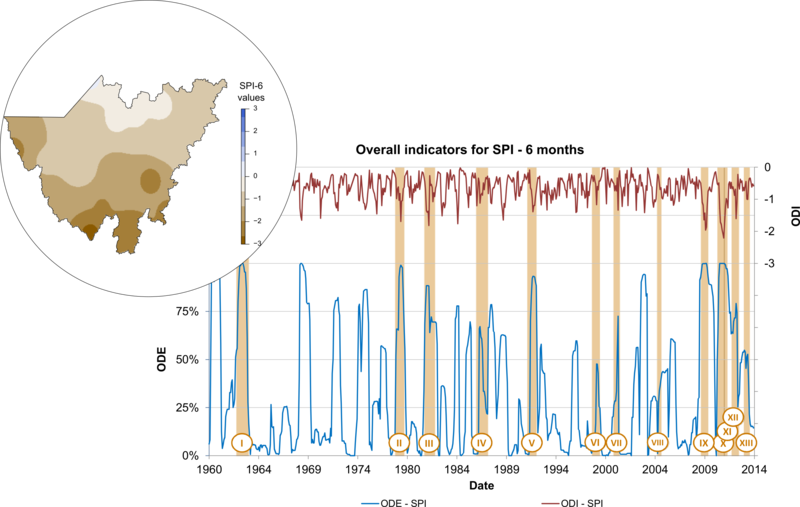 Figure 3 shows the example of the standardized precipitation index for a 6-month timescale (SPI-6) calculated in October 2012 (corresponding to the drought event XII) and spatially distributed at the lower JRB, where brown colors represent regions under drier conditions. Figure 3. Extrapolated SPI-6 values in October 2012 for the entire lower JRB. According to the criteria proposed in Table 2, detected drought events were identified based on the index values. Then, the ODE and ODI indicators were calculated for the lower JRB. An example of the resulting ODE and ODI series is shown in Fig. 4 for the SPI-6 and RAI-6 combinations, along with the recorded historical droughts shaded in orange (complete results can be found in this article). Figure 4. ODE and ODI values using the 6-month time scales of SPI and RAI indices, compared with the 13 detected historical droughts (in orange). The objective is to establish a combination of timescale and index that offers an optimum identification of historical droughts. As stated before, the main criteria used to contrast the performance of the forecasts is that a drought event is supposed to happen when the ODE value exceeds a threshold that is to be defined. The combination finally retained should maximize the number of hits and minimize the misses between the forecasts and the observed events. The 1-month-scale overall indices show rapid fluctuations that correspond to short periods of precipitation deficiency not captured in the catalog of historical droughts. This is mainly due to punctual, large rainfall events that have an important influence in the indices, which may indicate that the drought had ceased when it is not the case (Barua et al., 2011). The opposite effect occurs when using the 48-month scale. The inertia of the rainfall shortage tendencies may mask shorter droughts and overestimate their durations. Since most of the episodes last 1 year or less (Table 1), they are hardly detected using the 48-month scale. Therefore, using the 1- and 48-month scales do not provide any substantial information about the occurrence and duration of the droughts and have been excluded from the performance analysis. For the rest of the timescales (3-, 6-, 12- and 24-month timescale), the ODE threshold indicating the occurrence of a drought is required for the computing of the PSS that will serve as a support for the selection of the best combination of the index and timescale. A sensitivity analysis was performed using the same threshold across all of the combinations and exploring the effect of varying it in a reasonable range (in this case, from 0.3 to 1 by 0.1 steps). The resulting PSS values are shown in Fig. 5. The black bars indicate the statistical error estimates (confidence intervals) at 95% confidence, due to sampling uncertainties, assessed with the statistical significance test described in Sect. 4.4, which allows indicating whether the score is significantly different from zero. According to the results, most of the PSS confidence intervals do not include zero, disproving that skill scores could have identified drought events by chance sampling fluctuations. For some of the indices on the 24-month scale (e.g., RAI-24 for an ODE threshold=0.7), results cannot assert that skill scores are significantly different from zero and thus these combinations should not be considered. Figure 5. PSS results for different ODE thresholds, with the black error bars representing the 95% confidence interval (±1.96 standard errors) when sampling uncertainties are considered. Attending to the PSS values (Fig. 5), results show a consistent tendency across all ODE thresholds of higher PSS at the 3- and the 6-month timescales. Moreover, there is no single index that clearly produces better results. Indeed, based on the PSS values and taking into account their uncertainty, there are no statistically significant differences across the different indices for the 3- and 6-month timescales. This indicates that, for these timescales, all the indices perform similarly well in capturing the events. However, it is worth mentioning that, in general, higher PSS values for the 3- and the 6-month timescales are produced using ODE thresholds between 0.4 and 0.6. All the observed drought events have their corresponding ODE peaks. Although event VIII has an estimated duration of 3 months, ODE and ODI results consistently show a longer drought. The exact period of this drought is not well defined as indicated in the catalog, leaving room for a longer duration of the real episode. In general, all the indices are well correlated, identifying most of the recorded droughts. Several droughts are consistently detected between event I (1962) and II (1979) even if no drought has been chronicled (false alarms). This may correspond to the above-mentioned scarcity of reliable information on droughts prior to 1980. The drought events IX, X, XI, XII and XIII are well captured. The different events during this period (2009–2014) match with the consecutive increases in the ODE values for all the indices (DEC, PN, RAI, SPI). However, the 6-month series of ODE suggest some false positive detections: more drought events than the observed are calculated. Regarding the 3-month ODE series, results suggest an overestimation of the number of detected events, as sometimes several detected events combine into one (longer) observed event. The 6-month timescale appears as more appropriate. In summary, according to the ODE series presented in this article and to the forecast verification carried out with the Peirce skill score (Fig. 5), it seems that the best timescale for the identification of droughts is at 6-months. Results show an equally effective performance of the ODE series for all the indices. However, the risk of false positives must be addressed carefully, as the observation record likely misses events, in particular between 1962 and 1979. Despite the good performance shown by the overall indicator ODE in drought detection, caution is advised. In particular, the choice of meteorological indices as a basis for the calculation of the ODE and ODI can lead to errors when assessing drought occurrence. Temperature variability, not considered here, can play a significant role in the onset of agricultural drought. Meteorological indices may not be fully capable of capturing the impacts on water scarcity and could be complemented with other types of indices, such as agricultural or hydrological. The same approach proposed in this study is recommended using more comprehensive indices in order to better capture the complex drought processes. This study aims at applying overall drought indicators representing the drought status within the entire lower JRB investigation area. This work represents an attempt at building a tool for drought monitoring and risk management purposes on the basin scale. It is based on established meteorological indices for the identification of droughts and a method for a catchment-wide drought assessment and characterization, which is compared to historical drought events of the lower JRB. The information used for the identification and characterization of major historic droughts was compiled from different sources. A total of 13 major droughts between 1960 and 2014 were identified in the lower JRB and cataloged using a web-based registration platform, allowing for a comparison of the different events. Drought indices typically assess local water deficits while available historical records usually refer to regional droughts. To overcome this problem, two drought area indicators, the Overall Drought Extension and the Overall Drought Indicator, have been used to characterize the occurrence and intensity of an event within a specific investigation area. These indicators are based on four common meteorological indices on different timescales: the standardized precipitation index, the rainfall anomaly index, the percent of normal precipitation and the deciles index. By relying exclusively on precipitation, the proposed procedure serves as a basis for further studies in other regions where only precipitation data are available. The performance of the ODE in drought detection has been assessed by contrasting the results of this indicator with historical recorded events, offering promising results. It seems that the best results are independent of the index used and produced using the 6-month timescale. Although results suggest the same patterns for all ODE thresholds, it has been noticed that the highest PSS values are produced for thresholds between 0.4 and 0.6, which can be defined as a trigger to detect the occurrence of a drought in the lower JRB. Considering the challenge that the compilation of historical drought information represents and the identified limitations, this is a good method for the monitoring of drought episodes within an entire catchment. The use and contrast of drought indicators on the basin scale with historical collected information represent the main innovative aspects of this study. Since meteorological droughts are the first stage in the progression of subsequent agricultural or hydrological droughts, this methodology could be used to activate a management response for a drought event, which starts at a specific threshold value. Additionally, this methodology can be used to complete lacking information on droughts’ duration, geographical extension or intensity. © Author(s) 2018. This work is distributed under the Creative Commons Attribution 3.0 License. This publication highlights 15 cases of good practice in development and applied research from mountain regions, and illustrates how the Sendai Framework’s four priorities can be put into practice. This study has been conducted in the framework of the SDC’s ‘Glacier Project+’ highlighting both potential risks and options from shrinking glaciers and growing lakes in the Southern Andes of Peru. The Indo-Swiss Building Energy Efficiency Project is a bilateral cooperation project aimed at mainstreaming energy-efficient and thermally comfortable building design in India. The UN CC: Learn platform, funded by the Swiss Government and UN partners, offers free climate change-relevant learning resources that are backed by the UN system. This manual provides a common framework for climate vulnerability and risk assessment, a methodology for its application and guidelines for mainstreaming adaptation planning in development plans. This learning journey will engage participants from diverse topical backgrounds in a series of online discussions and webinars to learn and better coordinate and guide action on this topic.